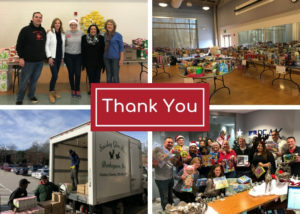 Once again this year, Leadership Montgomery’s members, corporate partners, and friends donated hundreds of gifts and M&T Bank customers and clients made thousands of dollars in contributions to bring holiday joy Montgomery County families supported by our partners at the Kennedy Cluster Project. At 9 am on Tuesday, December 18, a sleigh (disguised as a Smoky Glen Farm truck), full of donated food, toys and party supplies pulled up at the Mid-County Community Recreation Center in Silver Spring. Volunteers and staff from M&T Bank, Leadership Montgomery and the Kennedy Cluster Project team unloaded the sleigh and transformed the community center all purpose room into the “pop up store” that is LM’s Holiday Gift Distribution Party. By 1:30 PM, all of the donated gifts had been sorted and displayed, bags of grocery staples has been assembled, the room decorated, and refreshments laid out for families that had lined up and were looking forward to the experience. Each family was met by a “personal shopper” volunteer that helped them choose a gift for each child. In addition to toy gifts, families were given a gift card to Giant Food Store, a bag filled with grocery staples, a set of gloves/hat/scarf for each child and refreshments. Volunteers provided wrapping service for anyone that wanted to have a gift wrapped. The first 100 families also received a donated turkey courtesy of Kids In Need Distributors founder Jeremy Lichtenstein and his partners. At the end of the day, over 200 families and 500 children were served during the holiday season. A big thank you to everyone that hosted a toy drive, made a financial donation, or volunteered at the event. An even bigger thank you to our sponsors: M&T Bank and Chazin & Company for making this program possible.